TUESDAY, Feb. 14, 2017 (HealthDay News) -- Heart disease affects more than just the heart. It also can take a toll on the legs, feet, kidneys and even the brain, according to vascular surgery experts. Heart disease is a general term, usually linked to arteriosclerosis or "hardening of the arteries," the Society for Vascular Surgery explained. 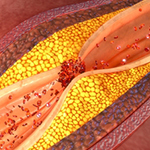 Arteriosclerosis is a progressive disease in which plaque builds up in the arteries. As the arteries become blocked, it becomes harder for oxygen-rich blood to flow throughout the body, said Dr. Ali AbuRahma, secretary of the society. AbuRahma is also chief of vascular-endovascular surgery at West Virginia University's Robert C. Byrd Health Sciences Center. Peripheral artery disease (PAD) develops when heart disease affects the legs and feet. This condition affects about 8.5 million people in the United States, according to the U.S. Centers for Disease Control and Prevention. When blood can't reach the extremities, feet may develop wounds that don't heal. Some people with PAD may need an amputation. People who develop pain while walking should talk to their doctor and have a non-invasive test that measures blood pressure in the ankles, the society advised. Treatment can help prevent serious complications. Hardening of the arteries can be managed, according to AbuRahma. "We recommend that everyone take a few sensible health measures to keep their veins and arteries healthy," he said in a society news release. "First, know your 'numbers' -- that is, manage your blood pressure, blood sugar and cholesterol. Don't smoke and get regular physical activity. Try to lower your stress level, too." People with vascular disease should be cared for by a specialist and stick to their treatment plan for the rest of their life, AbuRahma suggested. "Vascular specialists are trained to restore blood flow, but most of our long-term patients never need anything other than medication and good health habits," he said. "But if non-invasive treatments no longer work, we can install minimally invasive balloons or stents to unblock blood vessels, or perform open procedures, in which we create bypasses around a blocked artery," AbuRahma explained.